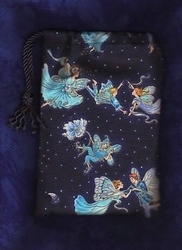 Venture into a fabulous fey forest every time you use your tarot cards. 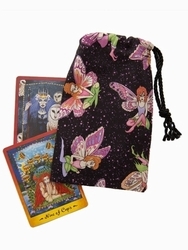 Each time you do a tarot reading, these coy fairies will be there to offer their magical support. 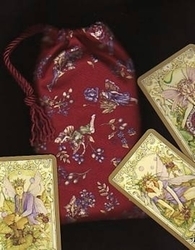 Each Fey Forest Lilac Tarot Bag features at least two scenes of a fairy (one on each side) in a different seated position. One is gently petting a frog friend, another is seated on the back of a tortoise. Others are sitting among foliage, fungus, flowers, or trees. 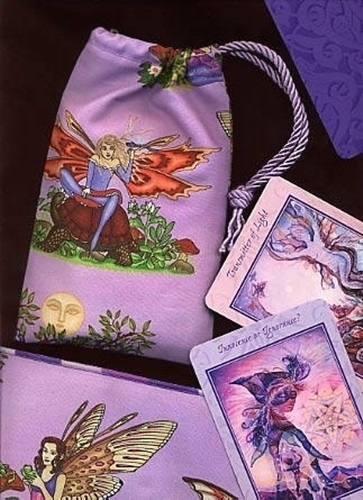 No two bags are exactly alike so the pictures represent the possibilities, but not the exact bag you may receive. 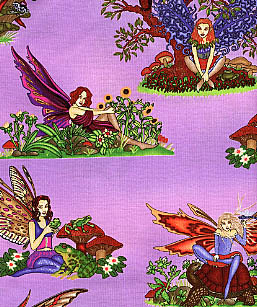 There are six different feyfolk on this fabric, but they will not all fit on one bag. 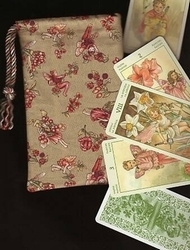 Suggested deck combinations: Almost any fairy themed tarot card deck with coordinate nicely with this bag, but we particularly like Nathalie Hertz's Faerie Tarot, The Fey Tarot by Lo Scarabeo, and Tarot of a Moon Garden by Sweikhardt.